I have a circuit that calls for a 74266 IC. I can't find this chip anywhere. What is it and where can I buy one? 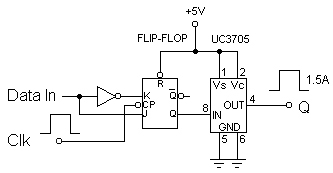 I need a high-power flip-flop — something more robust than a 7474, with an output current of 100mA at 5 volts. Do they make such a device? Rule #1: all logic chips are based on two functions, AND and OR. Throw in an inverter gate, and you can solve any logic equation. The 74LS266 chip Mr. Lewis is puzzled about is an XNOR (exclusive NOR) gate — a strange breed, indeed. However, it's easily made by adding an inverter to the output of a standard XOR gate, like a 74LS86, which is readily available. Here are other ways to create an XNOR gate. For further information on logic chips, their functions and how to make them work in your own complex logic designs, check out the two part article Small Logic Gates — The building blocks of versatile digital circuits. As for Mr. Fletcher's high-power flip-flop, output drive current can be increased by paralleling gates. Unfortunately, it takes 25 TTL drivers to equal 100 mA. A better solution is to use a half-bridge driver, like the UC3705 from Unitrode (now a division of Texas Instruments). The UC3705 family of power drivers is made with a high-speed Schottky technology to interface between low-level logic and high-power switching devices — particularly power MOSFETs. These devices are an optimum choice for capacitive line drivers where up to 1.5 amps may be switched in either direction. With both inverting and non-inverting inputs available, logic signals of either polarity may be accepted. Supply voltages can range from 5V to 40V.